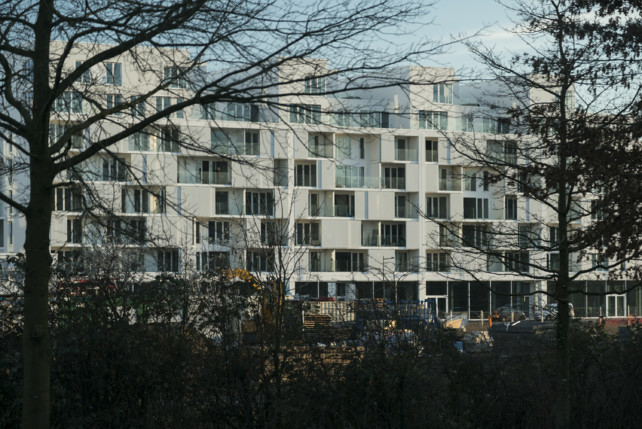 CITY DOX is architectesassoc.’s first project alongside the western stretch of Brussels’canal zone. 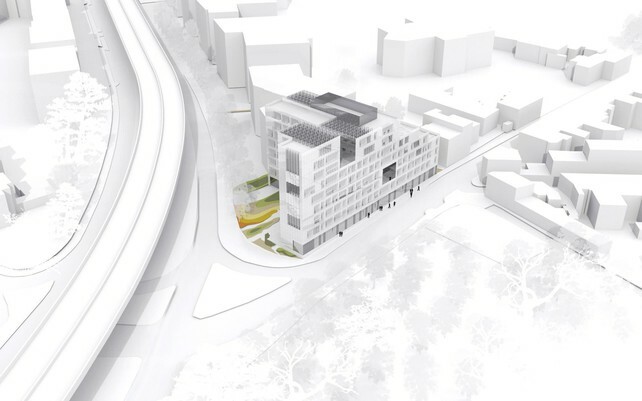 The project is an exercise in mixity, offering not just housing (93 flats) but also ultra-modular workspace floating atop an uninterrupted semi-industrial ground floor. Accordingly, density and synergy are critical issues here, leading to attentively assembled volumes conglomerating to form a coherent city block, itself just one of the dozen or so constituting this large-scale soon-to-come neighborhood developed by Atenor. Silhouettes are simple, sometimes askew in order to widen perspectives, preserve intimacy, and get more sunshine in. Accordingly, the full-width terraces offer shared views of this peaceful landscape along the bucolic poplar-lined canal way. CITY DOX develops 20 608 m² above ground level and 3 512 m² below ground level. December 2018 marks the end of work on HD54, delivering 10.000sqm of office space for client AXA BELGIUM after more than 18 months of heavy refurbishment. The transformed built and unbuilt forms and landscaping have considerably modified the initial 1980’s building. Notable changes outside include a new staggered skyline overlooking the Forêt de Soignes, a scaled down mass responding to low-lying neighbours north, and large carved-out loggias offering framed views of the surroundings. These inside-out loggias, along with re-organized circulations and fluid workspace spilling out onto stepped-back terraces, demonstrate that work has equally concentrated on qualifying what goes on inside. User-comfort for example has led to fine-tuned sun and glare protection. This detail-driven thinking results in delicately calibered shading and made-to-measure metal works on the facades. Well-being criteria have led to timber facades, carefully elaborated in order to maximise daylight inflow and minimise cooling needs. Their large-scale pre-fabrication off site has led to extra-ordinary quality control thus ensuring the sustainability of the ensemble not to mention minimum site-impact.Finally, the extent to which the building's original double-pane glazing, earth-toned bricks and good-as-new partitions have been convincingly upcycled elsewhere proves that large-scale efforts to integrate circular economy can work when motivated client, architect and contractor (BPC) put their minds to it.Time spent such important global issues have led to little energy left for formal antics. Indeed, given HD54’s strategic position marking Brussels’ eastern gate, just sitting there draws attention … thereby justifying a minimalist approach to facade design. Windows are straight-forwardly positioned following the initial 1980’s layout when possible and pertinent, opaque zones simply clad in glass-mosaic, and sun-shading self-evidently distributed following the 90cm grid present throughout. Nothing very savant, the whole very intuitive. But it remains crucial to understand that this whole is forcefully served by detail-oriented efforts made at all design AND building sub-stages, addressing head-on the humble down-to-earth task of getting things (well) done as shown below.architectesassoc wishes to thank all participants for the wonderful ride. Leopold Views aims at pertinently converting an office building into a residential ensemble. The principal quandary here therefore is the squaring of the well-being of the future diverse occupants of the tower with living in what was essentially dry and dull work space. 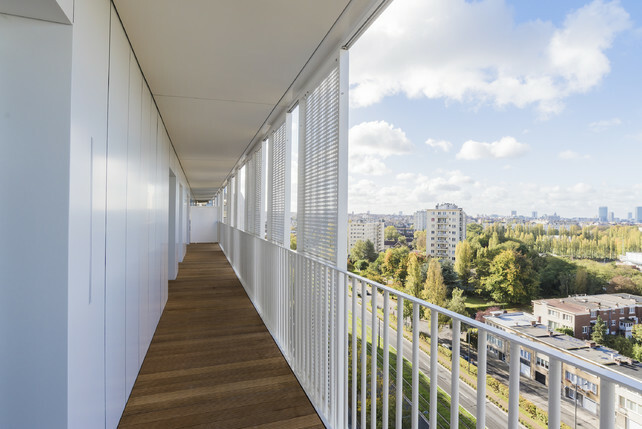 To achieve this, each interior area benefits from a wood-decked terrace which acts as a fluid transition between inside and out, so providing residents with a qualified relationship with their environment not often experienced in a tower. Owing to the modular perforated sliding panels fitted to each terrace, the occupants gain the novel freedom to create their degree of privacy at any given moment. A great deal of attention has been paid to light filled common spaces which stimulate natural interactions for all, including ground floor shops, spaces for professional activities, a large bicycle zone, as well as common 13th floor rooftop terraces and lounge for get-togethers available to all residents. The quality of this common qualified space is essential to the sustainability of the project. Developed for client Matexi, its first occupants are due to move in by the end of the year. The hope at architectesassoc is to exemplify how we can successfully shift from obsolete to innovative, from isolated to connected, and equally from bland to bold within a standard budget. From this point of view, conversion of office space into residential is a privileged road to pursue in order to respond to sustainability goals and higher demands for housing. Indeed, office construction offers the advantage of higher floor-to-ceiling dimensions greatly increasing the quality of the lived experience and the ease with which techniques fit for housing are integrated. In addition, avoiding demolition/reconstruction and engaging in upcycling remain important factors of sustainability as well as part of environmentally sensitive responses considered globally.